Five brave researchers have completed a computer analysis of Tyrannosaurus rex, looking especially at the implications for locomotion, ontogeny and growth. John R. Hutchinson, Karl T. Bates, Julia Molnar, Vivian Allen, Peter J. Makovicky built the beasts. The giant dinosaurs grew quickly as far as we know, and the process is ultimately fascinating to everyone. From a 10 kg hatch weight to the 6000 kg adult Tyrannosaurus rex in 20 years is a speedy growth of a kind rarely found outside theropod dinosaurs. A faster peak growth rate found here points also to the figures for 50% adult body mass. 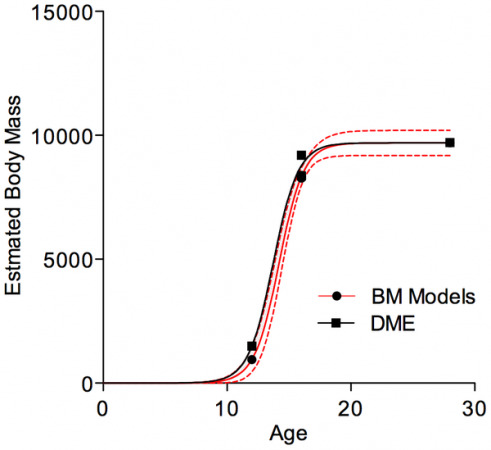 Achievement of that weight at the younger age of 12.9 to 14.2 years does not seem to match an attainment of somatic maturity at 16-17 years, but these results are solely aimed at incorporating new mass data. They do not pretend to apply biological data in an attempt to modify calculations, in this case. The graph shows almost no variation in growth estimates. Like alligators, the young T.rex had to change its life-style (and ecology) rapidly as it grew. They both had to adapt to body change while new diet "menus" would be used to supply the increasing need for protein. What was recently found as the Maastrichtian tyrannosaurid, Nanotyrannus has now been widely accepted to be a juvenile T. rex. Quite a find, for these workers keen to see how accurate predicted shapes and sizes were! During development, the torso became longer and heavier whereas the limbs became proportionately shorter and lighter. The results very successfully show the change in mass of the forelimbs. "The forelimbs clearly became proportionately lighter from juveniles to adults (by as much as a factor of 10)", the report states in its discussion area. While other body parts show problems such as "incomplete preservation and unstandardized mounting techniques", the forelimbs are accepted to have adopted different functions during growth. 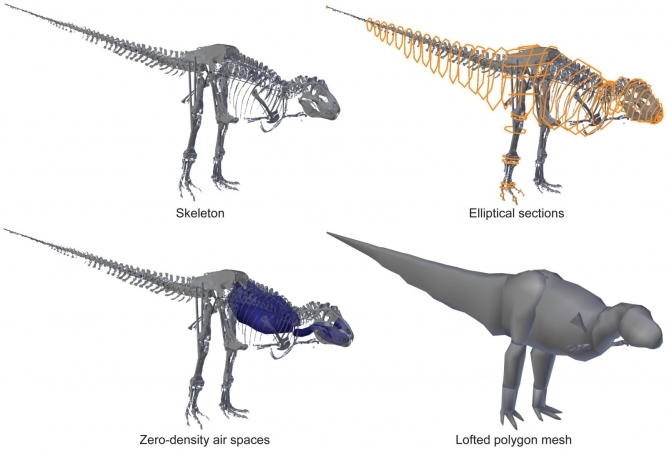 Locomotion of T. rex remains ambiguous. Evidence for a declining relative maximal performance of the hind limb muscles during growth is quite strong. Tyrannosaurs and other theropods possibly had the largest limb muscles of any land animal, but huge hip or even knee extensor muscles may not connect with their running ability. One theory is that the body needs to be balanced by large hip extensor muscles, which would not therefore be developed for running. Speed is still assessed at 5-11 metres per second, as it has been by other authors, since 2007. The individual animals used in the study were basically the best preserved T. rex specimens known. 3D scans were taken and transferred into graphics software as indicated in these four stages.